This proves that every quilt doesn't have to qualify for THE QUILT SHOW. 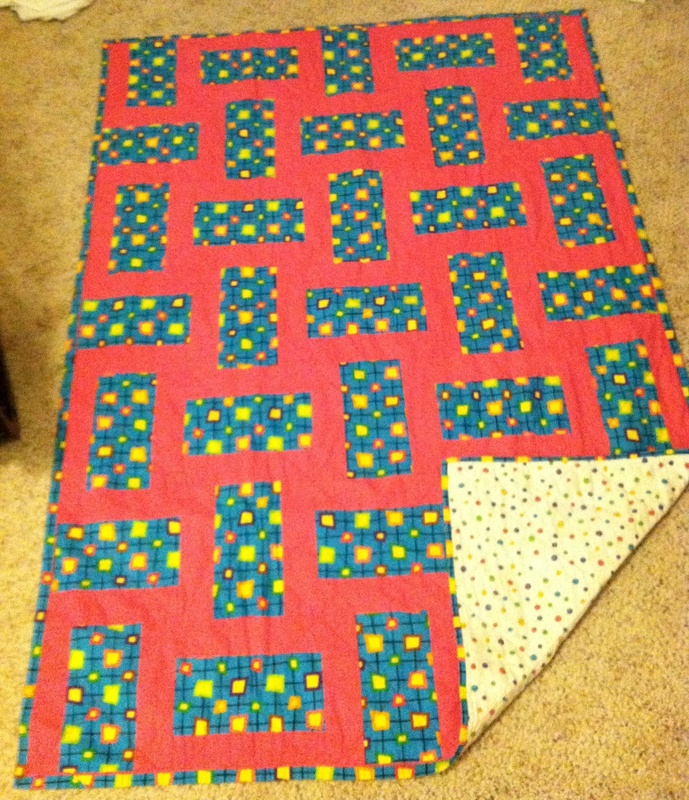 I made my three-year-old granddaughter a simple quilt. When her daddy held it up for her to see, she really looked it over. Then she exclaimed, "It's amazing!" And off she went to bed with it. That's the best response to a quilt! Warms your heart! And you can always count and total honesty from those sweet young ones - she said it all!!!! Several years ago, I was showing my SIL and several other relatives the quilt tops I had made. I told them to pick one each and I would finish the quilt and it would be theirs. A niece's daughter, who was 6 or 7 at the time, whispered to her mother, who immediately said "You have to ask." She turned to me and pointed to the only "kid" type quilt I had and sweetly asked if she could have it. I told her she would have to pay me for it, then smiled and said the cost was a kiss and a hug. She flew into my arms and gave me one of the best hugs and biggest kisses I had ever gotten from a child, bar none. She carried that quilt with her the rest of the weekend and, according to her mom, still has it on her bed at home. I made my granddaughter a quillow to take to college. She wore it out and needed another. I have made her a total of three now. Uses the pocket part to put feet and cover up with the rest. I love this thread! Heart Warming and oh so true! Thank you all. I would like for it to have been something outstanding, but to her- it was. Very pretty quilt and a great response! Love this story!!! and great quilt. Your quilt was so cute, and her response was just precious! I had made my two nephews and niece each a simple nine patch quilt for their beds when they came to visit. They were 4,6,and 7 and at the time. They absolutely adored them. Now the youngest nephew who is 26, still snuggles with it while watching television. My sister told me he still loves it. I think it is time for a new one! I love the original story and the others that people have been posting! I made an Attic Windows I Spy for a 3-yr-old little boy who recently got a baby sister. When he opened the package he said, "Is this mine? All mine? Just for me?". He won't allow anyone else to touch it. Terrific quilt, and her honest answer= priceless! Great job grandma! Those smiles and hugs certainly warm our hearts don't they? I love all of these stories! Thanks for sharing. It IS a great quilt! There are jaw dropping masterpieces at Quilt shows but a quilt made with love to use, is the BEST quilt to me. MiMi - Your quilt is darling! Since your GD loves it, that's what matters most, right? Love that quilt. I have made 4 quilts with that pattern and love that pattern. I made one with green Monkey fabric and brown fabric and it looks 'awesome". My granddaughter is 3 1/2 and I have made her 4 quilts already. She loves the "blankets" I make for her and is very excited. She lives in CO and I give her one every time they come here (MN) for a visit and she looks forward to getting a new one each time. So far, I have not used this pattern for a quilt for her--maybe will have to use this pattern for the next one I make for her. I also use this pattern for making Charity quilts as it is a quick, simple pattern. That is a precious response and keeps us doing what we do. Thank you everyone for sharing. Sometimes kids like the simple ones best! My BFF loves to make the art type wall hangings, but for sleeping under she wants simple. She says she couldn't go to sleep with too dark, too bright, or too complicated. Kids say the cutest things! When my son was 4, he was on a big word kick. He tried to use "big words" in his sentences. He was also a foodie! Still is, as he's a professional chef. Well, we were at my mothers for Sunday dinner and she made his favorite dish. When dinner was done, she asked him how it was, and he responded "Nana, it was disquisite". He meant to say "exquisite", but the "disquisite" just stuck, and how we use it as a joke word in our family to mean something is awesome!